Curved House Kids are hiring enthusiastic teachers! Curved House Kids are an energetic educational publisher with a focus on visual literacy and visual methodologies. We aim to make the art of communication achievable for all children, regardless of their skill level or circumstances. We take a democratic approach to learning and visual literacy is our secret weapon! This year we have run the Principia Space Diary programme in partnership with Lucy Hawking and Queen Mary University of London. This programme has been funded by the UK Space Agency as one of nine educational outreach projects associated with ESA Astronaut Tim Peake’s mission to the ISS. The programme has been a huge success, reaching over 60,000 primary-aged students across the UK, and we are now working to develop new resources and programmes that can be accessed in the classroom. We are expanding our resources library for primary and early secondary students (Key Stages 1-3) to include more free, downloadable learning materials for teachers and we are looking for experienced educators to review our work and help us build a library of first-class materials. These materials will teach a wide range of subjects using visual methods, and always intersecting with literacy learning and visual literacy. As a passionate and creative teacher, your job will be to review materials that we produce and help us to align these to the curriculum, making them as effective as possible for busy teachers. You will also attend our annual brainstorm in which you tell us what you think we should be producing and what we’re doing right and wrong. We’ll also show you new ideas and technologies that might improve your own work. This is a freelance role at an agreed hourly rate and we offer plenty of flexibility to fit in around busy teaching schedules. All work, bar the annual brainstorm, is done remotely and with plenty of notice. We expect it would be around 10 hours per year initially, plus one day for the brainstorm. Expenses will be paid for those who need to travel. This call is currently open to all teachers in the UK and Ireland. We are keen to hear from KS1-3 teachers and welcome those with specialisms in particular areas. Our materials are not tied to the curriculum but they need to be complementary, so it is important that all applicants have an up-to-date knowledge of the curriculum. Please click the link below to complete a very brief application form (it will only take 5 minutes) and we will contact you if we think you’d be a good fit. If you have any questions please feel free to email us at info@curvedhousekids.com. Four hundred years ago Shakespeare died in Stratford-upon-Avon. He left behind a legacy of 37 plays, 154 sonnets and two epic narrative poems. Since then, people all around the world have embraced his work, through books, plays, films and creative projects. We even use his phrases in everyday language, feeling ‘faint hearted’ (Henry VI, Part I), ‘dead as a doornail’ (Henry VI, Part II), or ‘fancy free’ (A Midsummer Night’s Dream). Shakespeare has given us wonderful insults, like ‘loathsome as a toad’ (Troilus and Cressida), and powerful descriptions of love, like ‘it is an ever-fixed mark, that looks on tempests, and is never shaken’ (Sonnet 116). In almost any situation, you could find a Shakespearean line to express how you feel. Young people often find Shakespeare difficult to engage with – it’s a little like learning a foreign language! Seeing his plays live or as films can be a great starting point. But decoding Shakespeare’s sonnets is a bit harder, since they’re not often performed or produced. 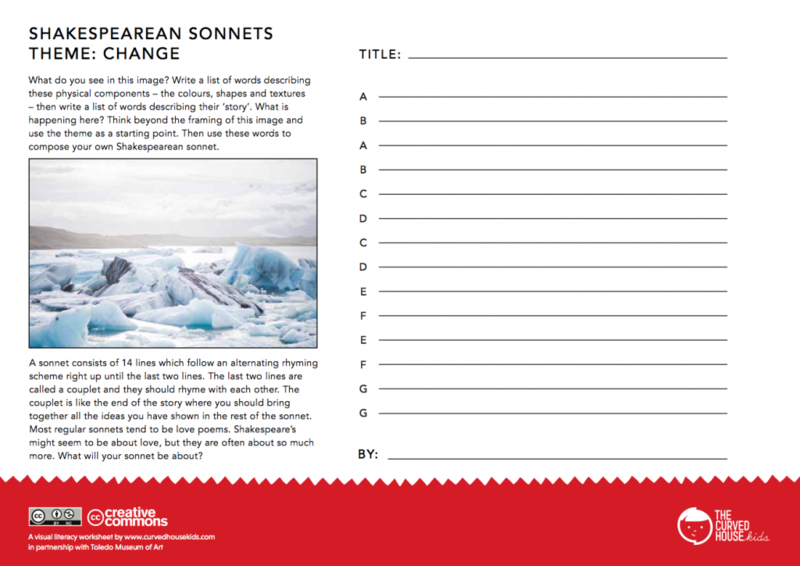 At Curved House Kids, we like to take a hands-on approach to making literature accessible, so we’ve developed a suite of ‘Write your own sonnet’ worksheets for students in Key Stage 3-4. 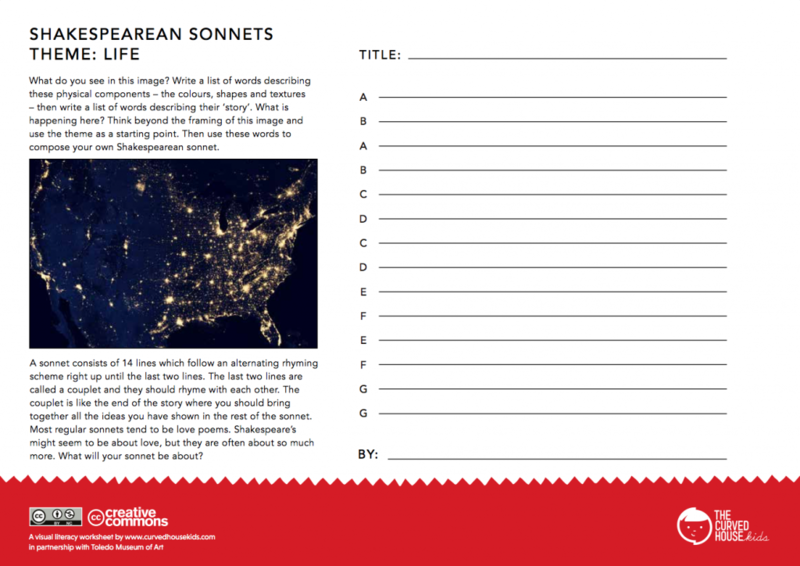 Our worksheets explain what a sonnet is and how it’s structured. They provide a simple template so that young poets can plan their rhyming scheme easily, without getting lost on the way. Each template includes a visual prompt to kickstart the imagination. 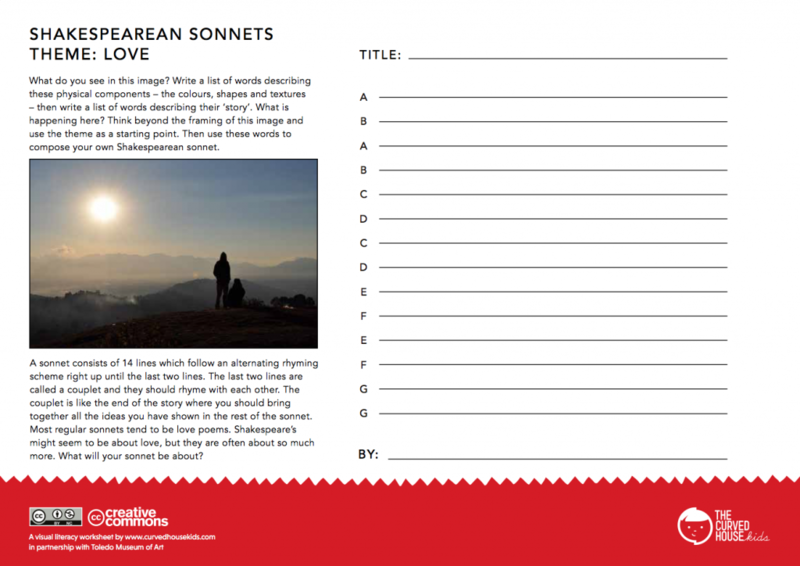 These prompts will help unlock creativity, providing inspiration for the ‘story’ the sonnet will tell and the vocabulary poets might use to tell it. 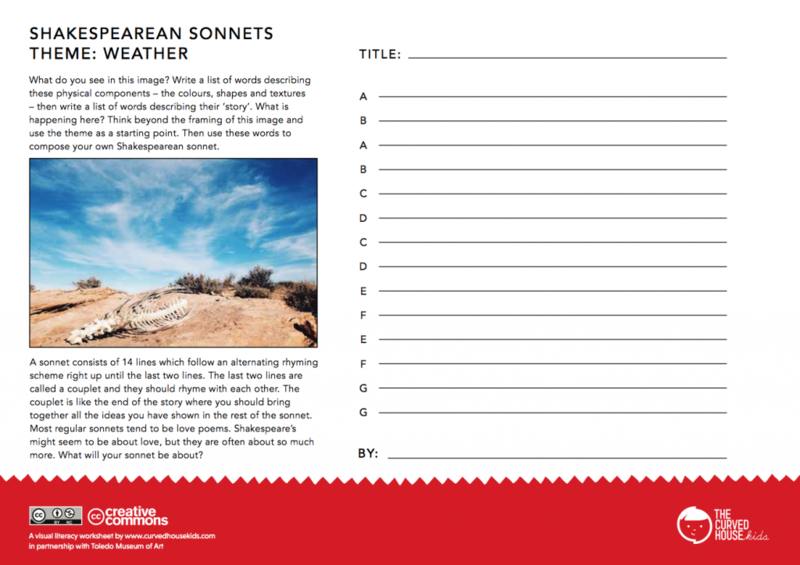 The prompts on each of our templates have different moods and styles, so your poets can choose one which appeals to them, or challenge themselves by writing several poems. 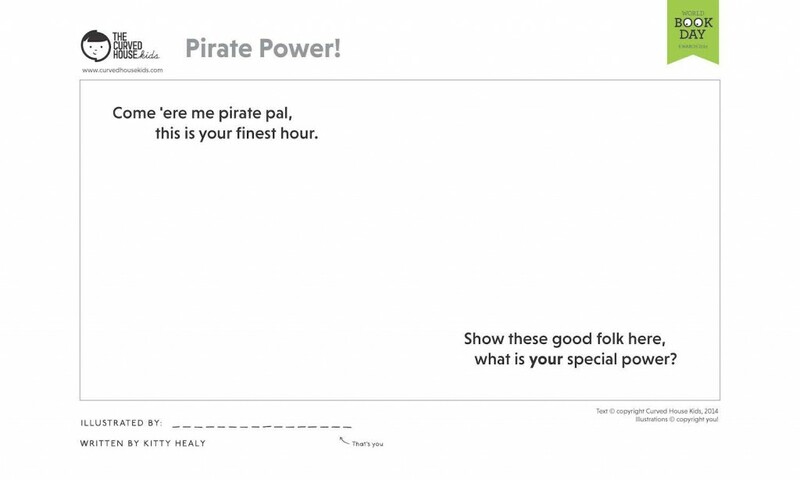 Download our worksheets by clicking in the image below and get your aspiring poets scribbling. Feel free to email us at info@curvedhousekids.com to share your work or use the hashtag #CHKshakes on Twitter, Facebook or Instagram! If you want to explore Shakespeare’s works in other ways, check out Shakespeare400. This year-long programme coordinated by King’s College London includes performances, exhibitions and creative activities for all age groups. Visit the Sheakespeare400 website for programme details. 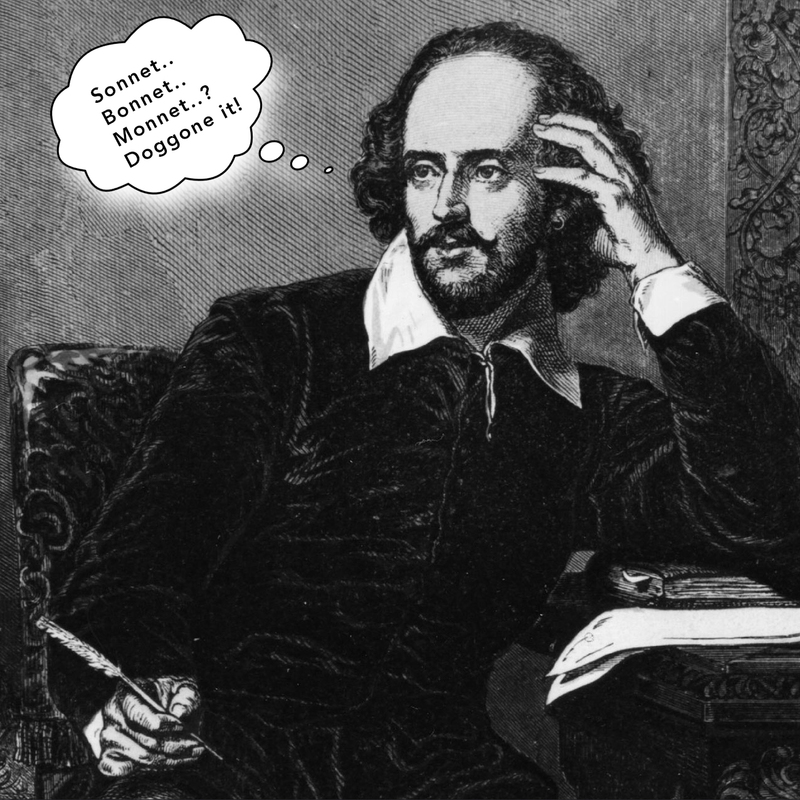 We wait with ‘bated breath’ (The Merchant of Venice) to read your sonnets! Hey, in case you didn’t know, this Thursday, 6th March, is World Book Day and that makes this week World Book Week. Woohoo! What could be better than a week long bonanza of books and stories. How are you celebrating World Book Day? We’re celebrating by visiting some schools, hanging out with awesome kids and by sharing some of our super dooper make-your-own books with you. 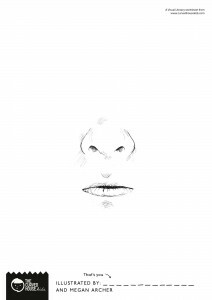 Illustrate your own book for World Book Day! 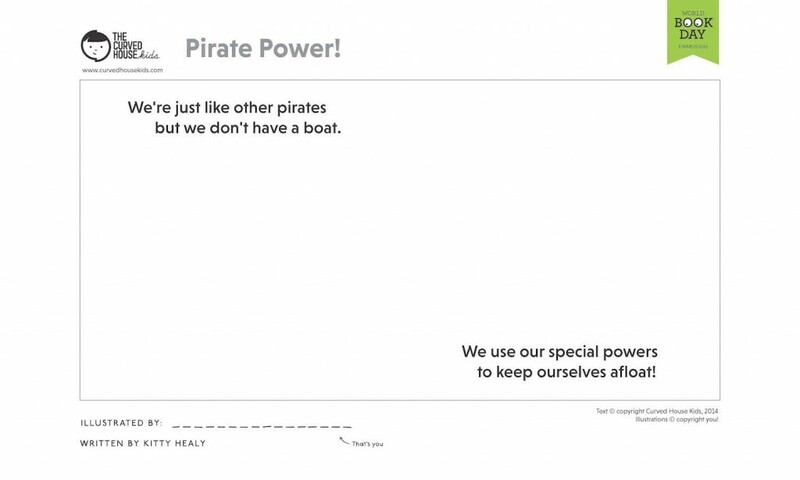 Every day this week we will release a page from our book Pirate Power, written by Kitty Healy. Kitty is a great writer but not the best illustrator, so we need lots of awesome, creative kids to do the drawings. Download, print and scribble every day and on Friday you will have a complete book of your very own. If you want to display your fine work in our online gallery you can send us a pic or upload it directly to: https://curvedhousekids.com/upload-your-book/. Click the image below to download the second page of your book! Wow, we’re halfway there! Click the image below to download the third page of your book! 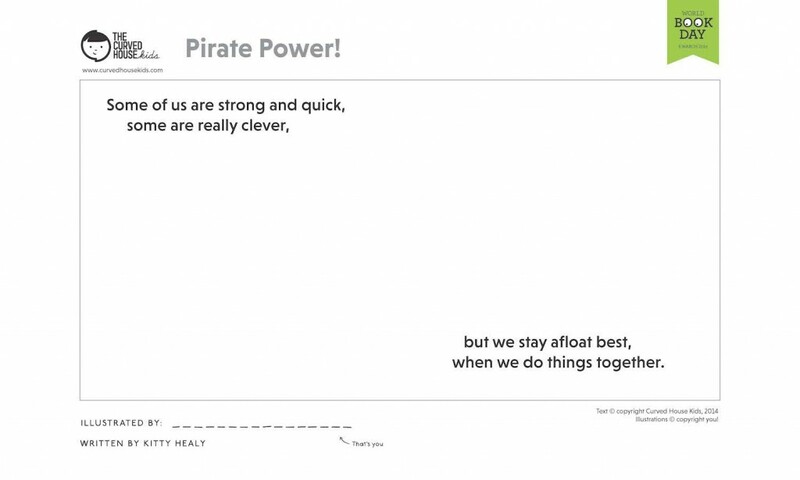 Come ‘ere me pirate pals, happy World Book Day! 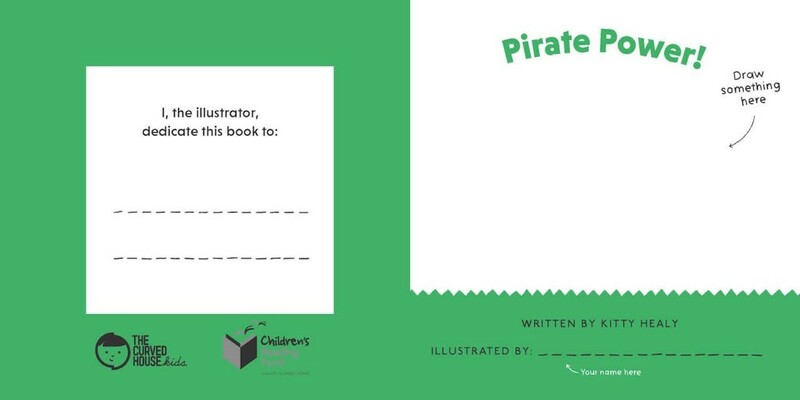 Click the image below to download the last page of you book and tomorrow you can download the cover to complete your make-your-own book for World Book Day. You’re nearly there! Now you just need to illustrate your cover, dedicate your book to someone special and then you’re done. Congratulations pals, what an amazing achievement to finish your very own book! Click the image below to download your cover.